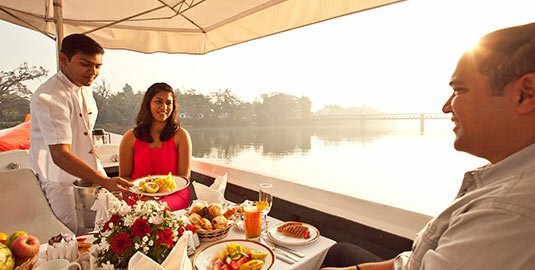 Join Mahaweli Reach Hotel and explore the magnificent city of Kandy. Things to do here include visiting ancient monuments and temples, cultural expeditions, river cruises and nature treks featuring an expedition into a forbidden forest! 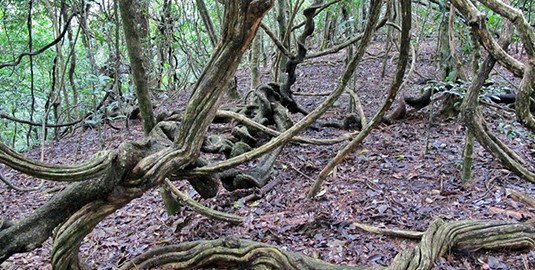 Explore the stunning Hanthana Mountain Range. Offered by Sri Lanka Day Tours, this expedition covers six to nine kilometres and takes about half a day to complete. Ideal for adventurers and bird watchers, this tour is guided by an experienced naturalist. 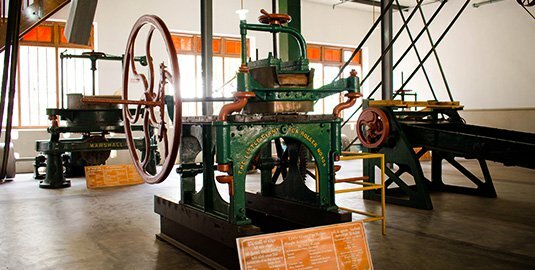 After hiking along the beautiful mountainous terrain of Hanthana, you will also get to visit the Ceylon Tea Museum. Holidays are the time for a bit of adventure, so join us to explore a forbidden forest. 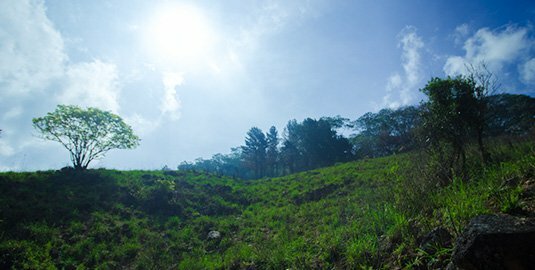 Udawatta Kele is a forest reserve that used to be a pleasure garden of the Kandyan kings and was forbidden to the public. Today, you can enter the 257 acre reserve and take a leisurely stroll under its lush canopies. The reserve is famous as a bird watching destination as it is home to about 80 bird species and varied mammal species such as the mouse deer, golden palm civet and the toque macaque. 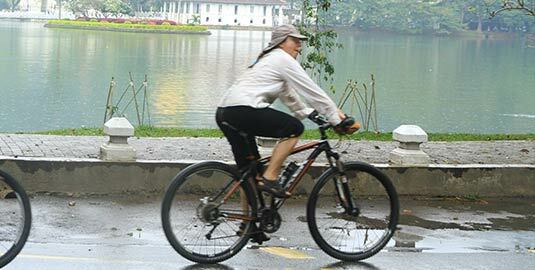 Peddle your way through the magnificent city of Kandy with our cycling tour and visit some of the city's top attractions such as the Temple of the Sacred Tooth Relic. Early morning you will set off for your two-wheel journey of the ancient hill city, which lasts for approximately three hours. This tour includes an experienced guide, bicycles, and necessary biking equipment as well as snacks and refreshments which can be enjoyed during the excursion. Cruise in style along the Mahaweli River. Our river cruises take you on a 45 minute ride from which you can see an abundance of flora and fauna. Some of the wildlife you will be able to observe include giant monitor lizards and exotic birds. The boat, which is only available till 05:30pm, can accommodate eight persons comfortably. Upon request, our staff can arrange a picnic for you, to be enjoyed while on the cruise. Travel to a traditional Sri Lankan village and experience the warmth and vibrancy of local culture. 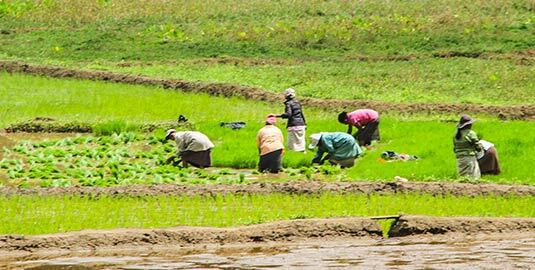 During the Panabokke village tour, you will be taken through paddy fields, spice gardens and orchards. Bird watching is also part of the tour and you will get to spot many aviary beauties such as Fishing Eagles, Golden Orioles and parrots to name a few. If you wish, you can either have a picnic at an “Ambalama” (wayside rest) or a traditional lunch at a villager’s house. Join Mahaweli Reach as we take you to see the creators of the “nation’s heartbeat”. On the outskirts of Kandy, are almost hidden villages that are home to drum makers who will introduce you to the industry which pulsates a nation. Music has a deep-rooted connection with Sri Lankan history and by visiting the homes and workshops of these drum makers you will get to learn and witness the entire process that includes carving, shaping and leather strapping. Once done, you get the chance to test the drum yourself! The lighting of a traditional brass lamp is the forerunner of any auspicious occasion in Sri Lanka as it signifies light, health and success. 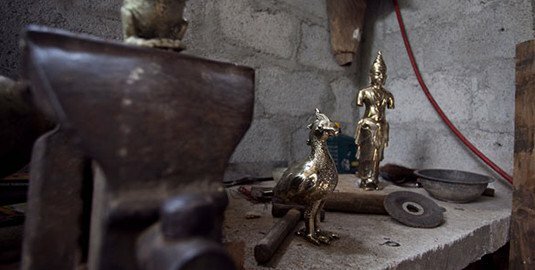 Witness the creation of how the brass lamp and other ornaments are made on a tour to the brass maker’s village in Kandy. Working with the master craftsman you will see the ancient methods of how to melt, pour & carve brass, as he crafts a thing of ornate beauty, painstakingly made by hand. 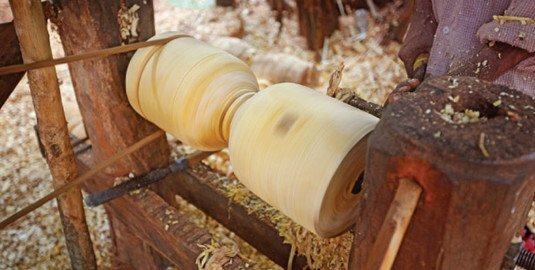 Spectacle making has been studied in the country since many centuries ago and in the misty hills of Kandy, you will be able to see this fascinating process. 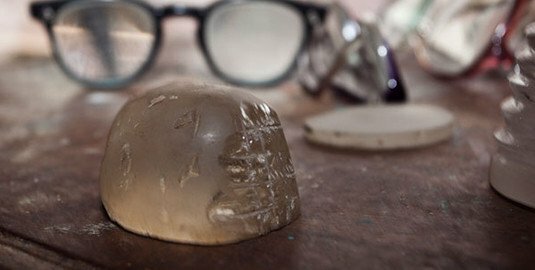 Almost at the brink of extinction, spectacle making is now practised by a master artisan who is a descendant of the original spectacle makers who made glasses for Sinhala kings. Mr. Gunasoma as he is named will gladly take you through the ancient methods of sculpting quartz into wearable & effective glasses, employing the very same tools & techniques used by his ancestors. Visit some of the most iconic temples of Kandy. The Embekke Devalaya is a 14th century temple dedicated to God Mahasen and is famous for its intricate wood carvings. Also called the Saddharmatilaka Vihara, the Gadaladenyia Viharaya is a unique temple as its main shrine is built entirely out of sculptured granite. See one of the most magnificent architectural creations of the Gampola kingdom, the Lankatilaka Raja Maha Viharaya. During the visit, you will also get to enjoy a traditional Sri Lankan lunch at a “Kamatha” or harvesting field. Ceylon Tea is loved all around the world for its sensational flavour. With our Tea Tour, you will discover the story behind the creation of this beloved beverage as it includes a tea plucking experience with workers at a tea plantation. This is followed by the chance to try out tea tasting and see the process of tea blending. The tour also features visits to a waterfall, the Hakgala Botanical Gardens, the Seetha Amman Kovil at Seetha Eliya and even a boat ride on Gregory Lake! (Entrance tickets / boat ride charges are additional). Learn the art of making traditional Sri Lankan food and take home with you an invaluable souvenir you can share with family and friends. The Culinary Expedition at Mahaweli Reach Hotel will take you to the bustling local markets of Kandy accompanied by our chef who will give you the opportunity to choose from a few local specialties / options. The journey itself is rather interesting as you will get to travel in a tuk-tuk or a vintage lorry. 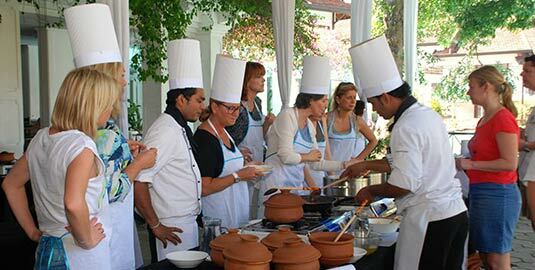 Afterwards, under the guidance of our chef, you will get to prepare rice and curry! 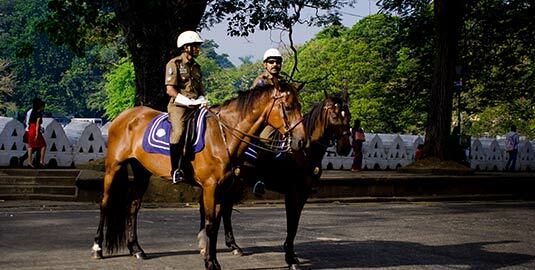 Tour the ancient city of Kandy with Mahaweli Reach Hotel. Our Kandy City Tours come with a selection of chauffer-driven air conditioned vehicles. 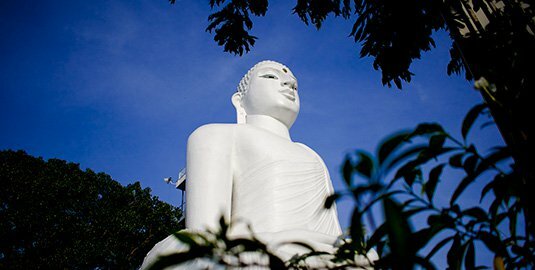 These tours can include excursions to attractions such as the Temple of the Sacred Tooth Relic, the Royal Botanical Gardens in Peradeniya and the Udawatta Kele nature reserve, along with shopping sprees and cultural performances too. If you wish something special, we can also provide you with a tailor-made tour according to your requirements. Take a trip around the town in a vintage Dodge! 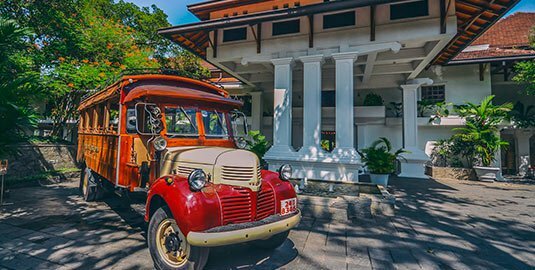 The newly refurbished Dodge lorry at Mahaweli Reach Hotel can comfortably accommodate up to sixteen individuals. As you tour the city in this classic vehicle, you are bound to grab the attention of the town folk and get many smiles and waves. 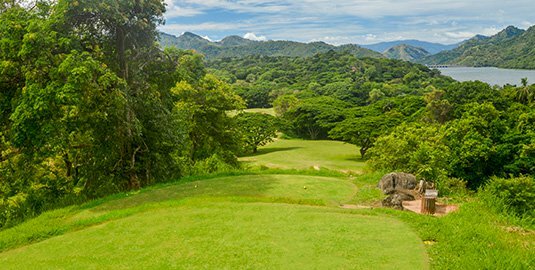 Tee off amidst Kandy’s stunning natural beauty. We organize golf tours to the Victoria Golf Course in Digana, about an hour’s distance from the hotel. If required, we can also book a round of golf on behalf of our guests, at this 18-hole course that has been ranked as one of the 100 Most Beautiful Golf Courses in the World. Additionally, you can enjoy activities such as horse riding, swimming and tennis amidst awe-inspiring vistas of the Victoria Reservoir. Varied packages are available and upon request, we arrange snack packs as well.